To those who knew her best, Kitty Castellini was a lover of bologna, a practical joker and passionate Disney fan -- not to mention a devoted mom and wife who had a quick wit and feisty personality, along with (believe it or not) expertise in explosives and hazardous materials. She also happened to be a tireless diabetes advocate who inspired countless people across the globe, founding the Diabetes Living Today weekly radio show and website in 2007 that was one of the early online hubs bringing our community together. Through the years, she received Congressional and state government recognition for her advocacy work, and made history as the longest-surviving pancreas transplant recipient who was basically cured of type 1 for several years. For more than a half-century, Kitty fought the good fight with a sense of humor and pluck that defined her spirit beyond diabetes. But our world lost her light on June 19 after several months of declining health. Our friend from Vineland, NJ, was 55 years old and she had lived with T1D for five decades. Kitty's death has hit the DOC (Diabetes Online Community) particularly hard. Many have been sharing stories and condolences online, especially those of us who met Kitty in person in those early days of the initial Roche Social Media Summit. 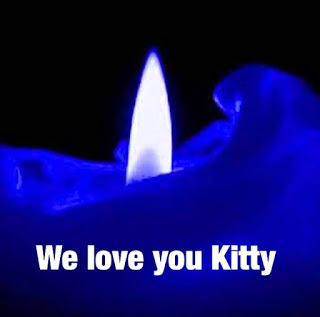 Hashtags #WeLoveKitty and #DOC4Kitty have cropped up in her honor, and our DOC has lit a collective blue candle in her memory. Her daughter Lauren says the DOC meant the world to Kitty. "She poured her heart and soul into diabetes this and DOC that, and she loved being able to reach out and help anyone she could. It made her so happy. That wasn’t work to her, it was a pleasure for her and very much an honor and privilege to be that voice speaking out to help people. You all meant so much to her, and were another family to her." Kitty was diagnosed with T1D as a toddler in 1963, and her older sister too was diagnosed with T1D at a young age. She shared her remarkable D-story many times in different places over the years, and this guest post from a couple years ago recounts her 50-year journey quite well. 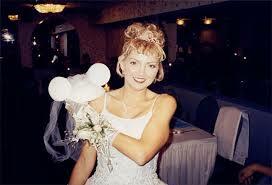 Of course, many knew Kitty following the pancreas transplant she received in 2004. A signature photo of her enjoying an ice cream sundae following the procedure at University of Maryland Medical Center appeared in numerous publications, and she was producing her own insulin for nine years up until 2013 when her transplanted pancreas eventually failed from a virus. That length of time made her the longest-surviving pancreas-alone transplant recipient in the world, and as she was effectively cured she'd often describe herself as a "former diabetic." "Her advocacy and dedication, that gave her a whole new purpose that she hadn’t realized she was meant to fulfill before the transplant," Kitty's daughter says. "I want everyone to know that she loved her work in the Diabetes Community." After 2013, she returned to a Medtronic pump (as she'd been on before her transplant) and became a Minimed Ambassador. Her Diabetes Living Today was a nationally syndicated weekly radio program on 92.1 WVLT. It was entirely her creation and she handled everything herself -- from selecting guests and topics, to sharing news tidbits, to designing and maintaining the show's website, and even securing the legal trademark protections. For a while, she co-hosted the show with Dr. Joseph Fallon, and after they parted ways professionally he remained her endocrinologist. 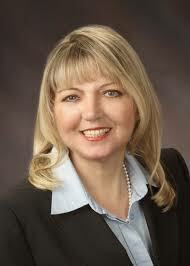 Among her many D-related achievements were recognition from the U.S. Congress and New Jersey Senate in 2007 for her diabetes advocacy work, and in 2011 she was recognized as a Roche Diabetes Care Hero and Torchbearer. Thanks to her own experiences, Kitty had a huge place in her heart for cure research and fundraising, and she'd become a strong advocate for the Diabetes Research Institute (DRI) in Miami, FL. "The Diabetes Research Institute and Foundation, as well as our entire community, lost a dear friend and powerhouse in advocacy with the death of Kitty Castellini. Having T1D herself, she would often remind us that she was a 'Union Gal' and participated years ago in our Dollars Against Diabetes (DADs) Event each Father’s Day. Her passing on Father’s Day, I believe in Kitty’s style, will serve as a reminder for many years to come that she will be with us. As an organization, we are sad, but were so fortunate to have had Kitty in our corner. She believed in our work. She fought right until the end… and we will continue in that spirit in Kitty’s memory. Our prayers, condolences, and thanks to her family for sharing such a wonderful woman with us, as well as the entire diabetes community." Kelly Kunik at diabetesaliciousness, a fellow Jersey gal who first connected with Kitty after reading a 2008 local newspaper story on her, cherished their friendship and regular phone conversations -- which were never short, Kelly points out. "Kitty was a DOC original with an incredible spirit and kind heart, a tremendous will to live and succeed no matter what was thrown at her in life," Kelly said. "She picked herself up and made adjustments without dwelling on it, and when life threw her lemons she threw 'em back." Diabetes advocate and longtime type 1 Gina Capone also met Kitty at the first Roche Diabetes Summit in 2009, bonding over a mozzarella and tomato appetizer and becoming instant friends. Over the years they became close and Gina considers Kitty a mentor, close friend and surrogate mother. Of course, Kitty's story is much more than just diabetes. As her daughter and friends remind us, Kitty had an indomitable spirit and fiery personality packed with unabashed kindness and compassion. She could be "loud in your face" and humble at the same time, in just that Kitty kind of way. As Kelly puts it, "Kitty was good at calming waves but rocking the waters when needed. She wasn't shy about telling you how she felt." Diabetes was really a second calling in life for her, so to speak. Kitty had retired in 2000 after two decades for the Laborers International Union of North America. She was a confined space entry specialist with a license as a first responder in hazardous chemicals and explosives. Throughout her career, she never missed a day of work and worked her way up the ranks from flagger to foreman, working on many Superfund construction sites with the Army Corps of Engineers. "She was really committed to her career, in the same way that she became committed to diabetes advocacy," Lauren says. "She knew she had a lot to lose, and she wasn't going to let anything stand in her way. That meant being a single mom, working a man's job, sending me to private school, and becoming such a voice in the diabetes community. She was a woman on a mission, in every aspect of her life." Anyone who knew Kitty can also smile at her other big passions in life: food and everything-Disney. Kunik, for example, remembers meeting up with Kitty at the airport and seeing her eating a bologna and cheese sandwich, a favorite as she loved that. Food became a big thing in her life after the pancreas transplant because she loved being able to eat without worrying about her diabetes, Kelly says. In another life, Kitty could have been a food writer... or a Disney advocate, based on that fandom. Often before and after diabetes events, Kunik remembers how Kitty would set aside from to travel to DisneyWorld to visit the park. She would sometimes call ahead to order Disney items ahead of time, and would bring an extra bag or suitcase to cart her collectibles home. Never enough time thanks to the events to go to Disney, or if the weather was too hot or cold? Nonsense, Kitty would insist the trip be made. And she was always punctual, especially when Disney was in play. The first time I personally met Kitty in real life, we sat together at the Roche Social Media Summit in 2010 (ironically, in Orlando). We shared our diabetes stories, but it was our mutual love for Disney that made us instant friends – as she was a self-described “Disney freak” and my wife and I had honeymooned there. Turns out Kitty and her husband Gary took their marriage vows at DisneyWorld, and the park was a fixture in Kitty’s life. Almost every year for 25+ years, Kitty and Lauren would travel to Disney together as a mom-daughter tradition, and Kitty had a famed Disney collection, with countless collectibles all throughout their house. Their last visit was in October 2015, the first time they’d been to Disney during that month that happened to fall on Lauren’s birthday. Kitty insisted on going even though she was visibly weaker at that point. Lauren feels her mom may have unconsciously known it would be her last trip – at least for a while. Lauren plans to continue the Disney tradition, and will travel there later this year in honor of her mom. One story that stands out about her mom, Lauren recalls, was during her first of college around Thanksgiving time, when the local ABC affiliate in New Jersey was giving away a trip to DisneyWorld. Her mom would go to the nearby Boscov's department store every day to enter the giveaway, calling Lauren with daily updates on her entries. Lauren recalls just sitting down for lunch with friends in the college cafeteria when Kitty called and told her she’d won the Disney trip! She didn’t believe it. That Disney trip came before Kitty's pancreas transplant in 2004, and Lauren said her mom was still using her insulin pump at the time. She remembers Kitty doing a rose ceremony at the Magic Kingdom, tossing in a coin and making a wish at Cinderella's Wishing Well near the castle inside the Magic Kingdom. Since her mom passed away, Lauren says she, Gary and the rest of the family been touched by the outpouring of support from the Diabetes Community. She also has to laugh at how she feels her mom's spirit is still around, having fun. Her step-dad bought a nice suit for the funeral services and as he went to put on his dress shoes, the heels broke. So he opted to wear a comfortable pair of black shoes instead. We can't help but tear up when thinking about Kitty, especially when scrolling through her tribute page and photos online. We're so very sad to lose her, but it does bring a smile thinking she may be having blast with Mr. Walt Disney himself... and probably playing practical jokes on him, too! Kitty lives on in our hearts and continues inspiring us throughout the DOC. Thanks for everything you gave us, Kitty, and no doubt you'll continue making a difference in this world. This post by Michael Hoskins was originally published in June 2016 at DiabetesMine.